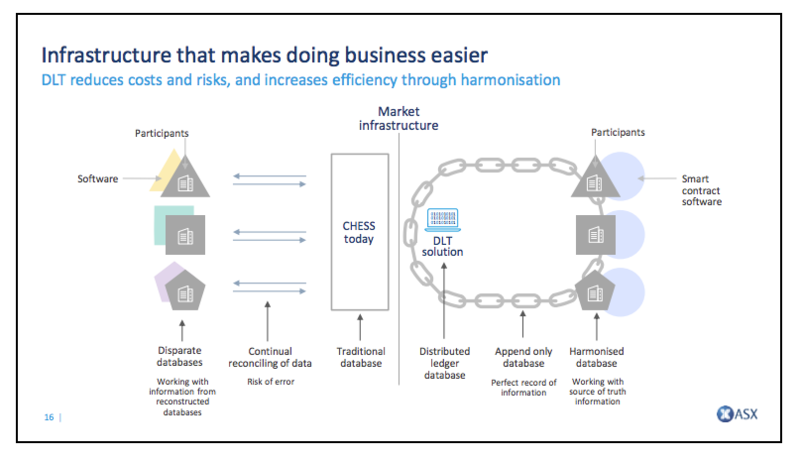 For almost three years, the Australian Securities Exchange (ASX) has been working with Digital Asset (DA) to replace its clearing system called CHESS. In yesterday’s results announcement, CEO Dominic Stevens revealed more details about the Distributed Ledger Technology (DLT) project. The new system moves away from every participant sending messages to a centralized CHESS system. Instead, participants have the option to operate their own node or server, which will contain the same data as all the other nodes. Hence there is a shared source of truth. Stevens compared the old system to the new and split the benefits into four groups. First off continual reconciliation across disparate systems is prone to error. 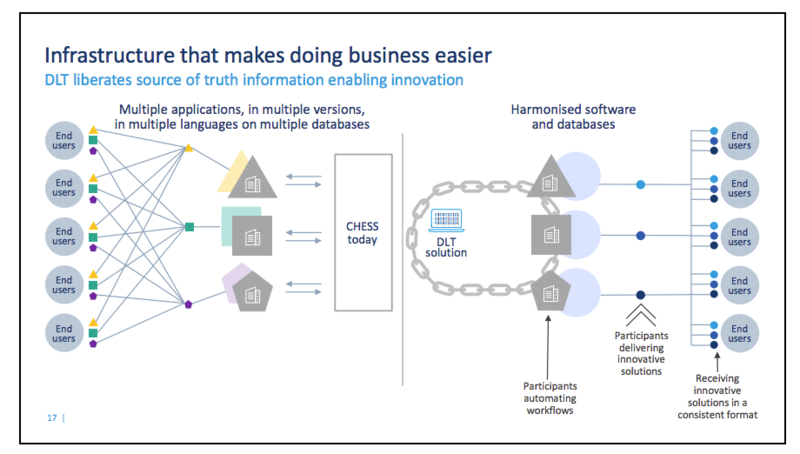 With a DLT solution, there’s a shared source of truth, so reconciliation and its costs disappear. Secondly, the old system involves every participant keeping their own database as well as maintaining and upgrading separate software systems. The new system is a shared infrastructure, thereby reducing risk, cost, and complexity. Thirdly, by using smart contracts and decentralizing, instead of purely interacting with ASX, participants can create multiparty workflows amongst each other, enabling innovation in the market. Fourthly, current systems involve dealing with many intermediaries each with different systems and data formats. Those intermediaries will now also participate in the shared network, and hence will look for service innovation to differentiate themselves. The overall message was that the system will be highly secure and still provide privacy. But at the same time, it will be a business enabler and the trigger for significant innovation. In addition, Stevens envisaged that DLT could bring enormous benefits to other financial sectors beyond equity clearing. In particular, he noted that the pensions industry has costs of $23 billion, of which equity clearing costs are just $100 million. His point was that if DLT can substantially reduce the costs of equity settlement, it could be leveraged to target much more significant cost savings. 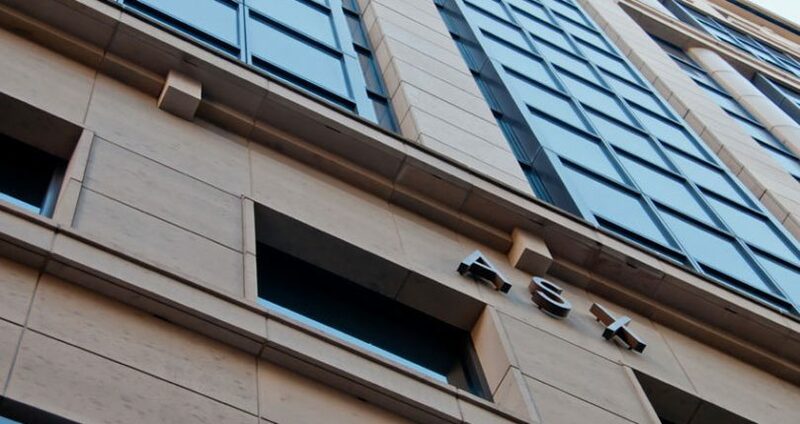 The ASX aims to start testing the new system in January 2019 with the aim to go live between Q4 2020 and Q1 2021.